Not Edinburgh but Jesus wept..
"King Arthur said because byways had recently been closed off, it left people "with nowhere to park" and unable to reach the stones in time for the sunrise." Soul Cycles' giant van at Straiton, narrowing one of the key car park channels to one-way. "Edinburgh Tram passengers are facing delays this morning due to a parked car blocking the line." Unless it was done deliberately to disrupt the trams (and TBH nothing would surprise me - there are still people who haven't got over the fact of their* existence) I don't think that car's "parked". It looks to me more like the driver got disorientated, drove on to the tracks by mistake and then panicked and abandoned their vehicle. Interesting article. I seem to be missing the connection to parking, though. Someone had parked here on the Royal Mile today, which was causing predictable problems. I'm not entirely sure it counts as "parking", but there's the biggest skip I've ever seen currently blocking the entire pavement on Leith Walk at The Black Fox. I've tweeted @edinhelp, but I don't expect they'll do anything. I'm tempted to phone 101, but they'd probably tell me to rule 2 off. Skip on Leith Walk still there 8am today. Also within that region there is a sign saying "cycle path closed ahead" which had been folded up and leaned against a bike rack; a sign saying "road works ahead" blocking the cycle path (is that the closure they meant?) and no actual works on the cycle path - they're on the road. At ~13:15 yesterday, the cycle path was closed from just past Albert Street, but all the signs were folded up and put at the side when I passed at about 19:00, and the only obstruction was one roadworks sign taking up half the cycle path width (Probably the same one you're referring to). I guess they're only closing the cycle path when the people are actually working there, which is good if so. If the sign were placed on the road, it would then block that lane, and an additional sign would be needed in the roadway further back to warn road users that the lane was closed ahead, and an additional sign would be needed in the roadway further back to warn road users that the lane was closed ahead, and an additional sign would be needed in the roadway further back to warn road users that the lane was closed ahead. The skip was still there as of 2pm, now with red and white tape around it, connected to the buildings - so blocking even more of the pavement. The cycle lane was closed again, and the inside lane / bus lane at the skip was empty and coned off, so no reason it couldn't go there. Additionally; I can't see how that skip can be picked up without the pickup lorry driving on the pavement. It's a road traffic offence for any vehicle with an operating weight of over 7.5 tonnes to even stop on the pavement. If it's still there when I pass this evening, I'll report it to 101. The signs stuff really annoys me because they are almost never necessary. Why on earth are multiple motorway-style lane closure warning signs required on a 20mph road? There seems to be no need for them when there's a lorry legally loading in exactly the same place as the closure despite it having exactly the same effect. If signs are really necessary eg. for diversions, there's no reason they can't be tied to lamp posts or existing signage - this might even make them more visible on wider roads. @jonty The irony of course is that the Road Works signs situated on the pavement aren't even visible from the road because of all the vehicles (double) parked between open lanes and signs. Literally all they achieve is blocking the pavement. I phoned the council skip permit folk - apparently if it's on the pavement it's almost certainly an illegal one, because they should normally be placed on the road. I pointed out that it's blocking the entire pavement, it'll be damaging the slabs, has been there for 2 days, and it can almost certainly not be legally picked up, since it's illegal for a skip lorry to be on the pavement for any reason (more or less). The skip wasn't there this morning ~8am. Bah, typical. It was there at ~7pm last night. Oh well, hopefully it won't be coming back. Aaand the skip is back. To make things worse, the cycle path is open, so everyone is milling into it to go around the skip. Sounds like another call to the council skip people may be needed. Also worth reporting to 101 because it is clearly causing an obstruction. 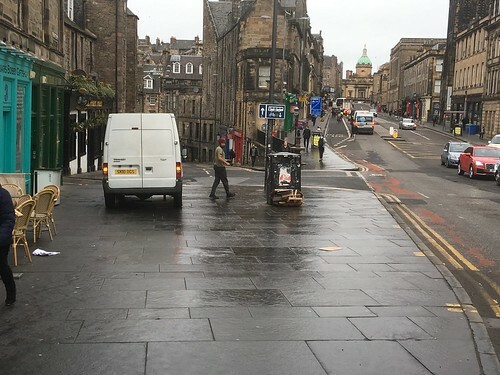 Latest from @edinhelp is: "Good morning, I appreciate all the tweets that are coming in due to concerns of this skip still being on the pavement. I have been in contact with the roads team, they have informed me that they are doing there best to get this skip removed as soon as possible." I watched this fella drive illegally over the pavement (from where I was standing to take the picture) to get there. It definitely wasn't lifted in by crane. He appears to be taking his packet of biscuits wrapper to the bin. I suppose we should be grateful he isn't adding to his illegality by littering. I had cause to leave work later this evening (Crewe Toll to Midlothian via Melville Drive) and was astounded at the amount of cars parked in the nortbound 'cycleway' on Melville Drive. Looked like it was to do with various "boot camps", running clubs etc which were going on. A bit thoughtless to be honest! Is that normal? I'm usually passing through pre 7am or 16-1700..just curious.